You have had it with public transit, biking, walking, or your current set of wheels, and have decided you need a new vehicle. You are not entirely committed to any one model enough to purchase it, so you decide that leasing a vehicle might be a better fit for you. As you peruse different models and dealerships, this term “residual value” keeps popping up. What does it mean, why does it matter, how is it determined, and how much does it impact the cost of leasing a vehicle? Residual value is one of the most important determining factors in the cost of a car lease, both to you and to the lender. The residual value is the estimated wholesale value the vehicle will retain at the end of the lease period. Example: If you lease a new $30,000 vehicle expected to depreciate 20 percent in the first year, the residual value of the vehicle at the end of a one-year lease would be $24,000. When calculating your monthly lease payments, the lender will use the residual value as one of the main determining factors. You will be paying for the depreciation of the vehicle (starting cost minus residual value) plus any additional interest, taxes, and fees. Example: When you are leasing a $30,000 vehicle expected to depreciate by 20 percent during the one-year lease, you will pay $6,000 in total for the vehicle’s depreciation, or $500 per month, plus the additional interest, taxes, and fees. Should You Lease a Vehicle With a High or Low Residual Value? The answer may seem obvious, but it is not always. If you are looking to lease a vehicle for a set amount of time and then move on with your life, then looking for a vehicle with a high residual value is a good idea. If a vehicle retains more of its value, then your monthly payments will be lower. However, if you think you will want to purchase a vehicle at the end of the lease term, then looking for a lower residual value vehicle is a smarter idea. Although you will pay more monthly during the lease term, the purchase cost at the end of the lease will be lower -- just the residual value plus any purchase fees. Car manufacturers love to lease high residual value vehicles. 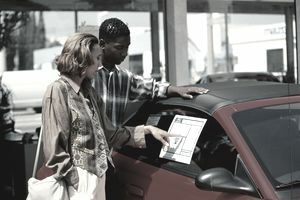 The high resale price keeps the used car market profitable, and the low monthly payments allow manufacturers to lease vehicles that haven’t been selling as well. Individual lenders love low residual values: they can lend a vehicle for a high monthly payment without having to worry about selling it at a high enough ending price to recoup on their investment. If you are thinking of buying a vehicle at the end of the lease term, it is a good idea to compare the total cost of leasing and then buying at the end of the lease term versus just buying the vehicle from the beginning. You might find that you save money by purchasing the vehicle from the get-go (or vice versa). How Do You Determine a Vehicle’s Residual Value? Professionals may utilize the Automotive Lease Guide, Black Book, or other resources, but every dealership and lender calculates residual value differently. If you are looking for a vehicle that will retain a high residual value (and thus lower your monthly payments), Kelley Blue Book produces an annual Best Resale Value Award guide. Ultimately, it will be the bank and not you who gets to determine the residual value that matters, but it’s a good idea to have a general sense of the highest and lowest residual value vehicles so that you can choose the best one for you. Is Residual Value the Most Important Factor in a Lease? Definitely not. The amount you are required to put down up front, the interest rate, and the taxes and fees are all very important considerations. If you have a poor credit score, your interest rate will likely be higher — and it is even more important to shop around for the best interest rate if you fall into this category. A high-interest rate, or high fees associated with a poor credit score, can add a significant amount to your monthly payment and thus the total cost of leasing a vehicle.